Ailsa has pushed my buttons this week, who can resist a sunset shot? As I have several on Lucid Gypsy, I had to try to pick something other than landscape. 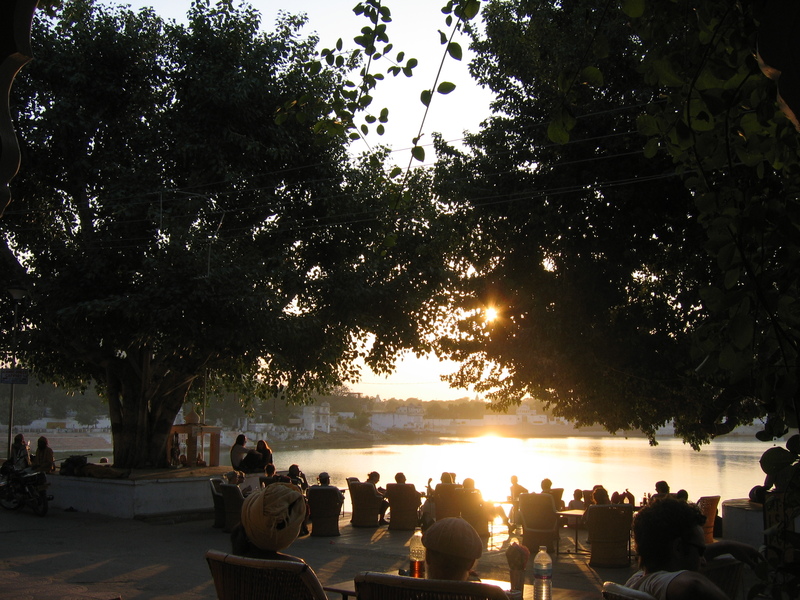 This one was taken in Pushkar, Rajasthan, at the Sunset Cafe a popular place to watch the world go by. Visit http://wheresmybackpack.com/ to see beautiful sunset shots from around the world. Gilly, this shot captures that special time of the day and the feeling of sharing it with others. It takes me back to moments of great happiness- on a Lake Michigan beach with my family as the sun sets over the water, in a beer garden in the hills overlooking Freiburg, Germany, playing cards at the end of the day, and other such moments. Indeed it is a beautiful place to watch the world go by. Magical sunset! Aaah so beautiful – sigh! It looks like a wonderful place to share a sunset with others. Beautiful shot. A wonderful sunset to a fun-filled day. Lovely. The sunset reflecting on the water looks peaceful. A lovely way to end the day. Nice one, Gilly.